Sorry we are not taking reservations but construction has resumed. For Reservations just click on a LOGO for direct link to our listing!/¡Para las reservaciones apenas chasque encendido una INSIGNIA para el enlace directo a nuestro listado! We are listed with HostelWorld and affiliates! Click on logo to book your reservation with us via Hostelworld.com! 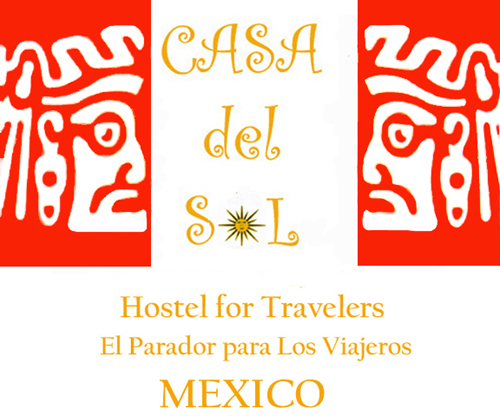 We are listed with Hosteltraveler and affiliates! Click on logo to book your reservation with us via Hosteltraveler.com! We are listed with Hostelsclub and affiliates! Click on logo to book your reservation with us via Hostelsclub.com! Off-Season use only! (June-Oct.) This will give you a 140.00 MXP credit on your bill and a confirmed reservation! We will email you, please print your receipt and bring it with you! ¡Uso fuera de temporada solamente! (Junio-Oct.) ¡Esto le dará un crédito de 140.00 MXP en su cuenta y una reservación confirmada! ¡Le enviaremos por correo electrónico, para imprimir por favor su recibo y para traerlo con usted!